Genflow - MedLume Scientific Co., Ltd.
Genflow　Blood/Fluid Warmer is an electronic controlled “Dry Heat” warming system without water bath. Compact body and right weight is designed for easy handling and transportation. No disposable is required. Genflow utilize tube of usual Infusion & Transfusion set your facility use now. 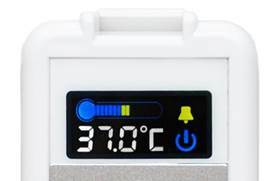 Genflow measures the tube temperature at every second and shows in a display. Recommended flow rate is 1~12ml/min. The tubing is embedded in the 'S' shaped groove in the aluminum heating plate with a cover to affect the warming process. This is designed to accept tubes with diameter from 4.1 to 5.0 mm in FIW-4150 amd from 3.0 to 4.0mm in FIW-3040. Small body but sophisticated program and high quality sensors are installed. Smart warming technology in Genflow Blood/Fluid warming device certainly measures actual temperature of tube surface at a few centimeters after heating plate each second. The temperature measured is timely displayed in a screen therefore operators can visually observe latest warming status. Furthermore the smart warming technology concentrates on prevention of Hemolysis risk. When the sensor measured the actual temperature warmed reaches at 39℃, high tone alarming tells you as high temperature. Please check it with video clip.